Windows 10's user share passed the 13% milestone last month, with a month-over-month growth spurt second only to August's explosive increase. 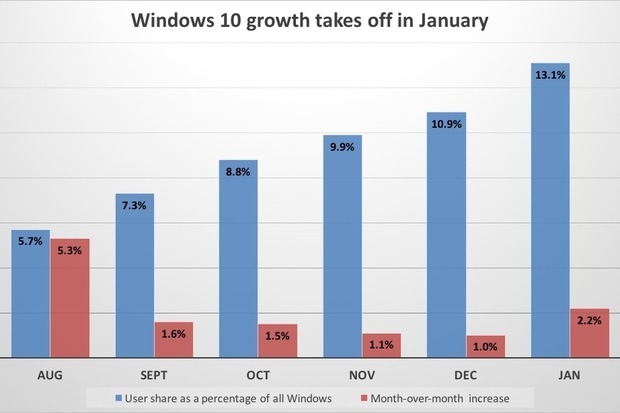 Windows 10's user share jumped in January by its second-largest one-month increase since its launch, data from analytic vendor Net Applications showed yesterday. At the mid-point of its first year, Windows 10 powered approximately 196 million systems. Microsoft's current claim of 200 million machines was made in early January. The jump in user share, an estimate of the portion of all personal computers worldwide that ran the OS was an impressive 1.9 percentage points, second only to the 4.8-point gain that Windows 10 recorded in August, the first full month of availability. January's increase was almost double that of December's. While Net Applications does not attribute cause to an operating system's changes in user share, one obvious explanation for Windows 10's growth would be from recently purchased new devices that were put into service in January. Those new PCs replaced Windows 7 systems for the most part: The 2009 stalwart's user share plunged 3.2 percentage points to 52.5%, the largest one-month decline in Net Applications' tracking, which goes back to the operating system's 2009 launch. Windows 10 accounted for 11.9% of all personal computer OSes and ran 13.1% of all Windows devices: The second number is higher because Windows powered 90.6%, not 100%, of all systems tallied by Net Applications. The 13.1% mark of Windows 10 meant that the new edition had not yet supplanted Windows 8/8.1 as the second-most-popular version of Microsoft's OS. Windows 8/8.1's combined user share in January was 14.5% of all Windows devices. Another data source, Ireland's StatCounter also showed that Windows 10's growth increased in January. StatCounter, which tracks global usage share, a proxy for activity rather than users, pegged Windows 10 at 13.7% for December, a 1.8-point gain. That was the largest single-month increase since September, when StatCounter booked Windows 10's growth at 2.3 percentage points. Windows 10's resurrected growth put the new operating system slightly ahead of the pace that Windows 7 exhibited after its first six months on the market, according to Net Applications. Windows 7 had accumulated a 12.8% share of all Windows PCs through its sixth full month. With about 200 million PCs running Windows 10, Microsoft is one-fifth of the way toward meeting its self-set goal of putting the OS on a billion devices by mid-2018. Still presumably to come: Microsoft; three months ago said it would begin to automatically serve the Windows 10 upgrade to most consumer and small business Windows 7 and Windows 8.1 PCs in early 2016. While Microsoft outlined the plan in late October and at the time said the two-part scheme would kick off "soon" by adding the Windows 10 upgrade as an optional item to Windows Update, the precursor to listing the upgrade as an automatic download by all evidence neither step has yet been taken. See The Guy Who Bought Google For One Minute.